Jay Bird Mfg Co, Inc. produces shelving to your exact specifications for store fixtures, displays, kitchen and bath cabinets, and furniture. Substrate options include particleboard, MDF, hardboard, HDF (High Density Fiberboard) and plywood. 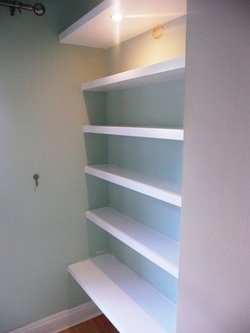 Raw shelves, Laminated HPL, UV Clear Coated or primed and custom color-match painted options are available. Our panel cut to size operations allow high volume, low cost, just in time processing of shelving. Edge finishing to your specs: straight-line edgebanding up to 3/4" edgethickness, edge foiling and tee-molding available. Lightweight cardboard core board available as option giving shelving giving thickness without the weight. An eco-friendly alternative or a product where weight is a consideration: ie RV industry.